KENYA HISTORY TODAY: Wilfred Karuga Koinange: Was this the Goldenberg Fall Guy? Wilfred Karuga Koinange: Was this the Goldenberg Fall Guy? Sometime in January 2009, Goldenberg suspect Dr Wilfred Karuga Koinange, who died yesterday, walked us past his empty car yard in Kiambaa where two rotting tractors, a broken down lorry, and other vehicle shells lay. Apart from a water bottling plant – he bottles Broomhill Springs water brand – there was little other economic activity in this expansive farm. Down the undulating hill lay a spring which Dr Koinange protected as his last source of income. “It is the only naturally carbonated spring in Kenya”, he says. From here, ever since he was accused of stealing Sh 5.8 billion via the Goldenberg scheme – a fictitious mineral compensation project that was hatched by Kamlesh Patni – the former Permanent Secretary in the Ministry of Finance had retreated into this farm with well-trimmed cypress hedges. Dr Koinange cut the image of a lonely man and this was no longer his family home. His well stocked library had many interesting biographies – including President Moi’s ironic biography “The Making of an African Statesman.” “Do I look like a person who swindled the country billions of shillings?” he asked as we sat at the backyard. We opened the backdoor to a tiny sitting room that had a well stocked fridge: Wines, spirits, sodas, beers and Broomhill water. “Take whatever you want,” he offered me and a senior Oxford University historian who was researching on the Koinange family. Unknown to many, Koinange was a history buff. He has one of the best collections of history books and rare colonial documents. He was also a great collector of African music and plants that dot his farm. Each flower type, he told us, had a history, and each tree told a different story. “The next time you come, I will play for you the banned Muthirigu songs”, he promised. Muthirigu was a Kikuyu dance banned by the colonial government for ridiculing the settlers. Koinange loved to sing too – and would mellow when asked something historical: But not on Goldenberg scandal and the tribulations he was going through ever since he was first arrested over the Goldenberg scandal. “This case has exhausted me,” he tells us long before he pleaded to the courts to give him a defence lawyer. Dr Koinange was angry that after all those years in government service, he was left fighting to clear his name over the theft of billions of shillings via a signature he had appended. In his court papers he does not deny that he authorized the three payments to Goldenberg International but told the Commission of Inquiry investigating the matter that he was commanded by President Moi to do so. He told Bosire: "I telephoned the president and told him I have been informed by Prof Phillip Mbithi that I should pay out all the amount outstanding to Goldenberg International and the president said yes, I have spoken to Prof Mbithi." Koinange signed three letters: 19 April, 1993, 28th June, 1993 and 8th July 1993. They sealed his fate. Moi, through his lawyer Mr Mutula Kilonzo, denied ever ordering Koinange to make the payments which left him as the fall-guy in the unending drama. Koinange’s letter were given to Mr T. K Werunga, an assistant Principal in the CBK’s banking division. Werunga, photocopied the letter and instructed a Mr Muraya (a clerical officer) to carry out Dr Koinange’s instructions. Although Dr Koinange’s specimen signature was not with the bank, since as the PS is not the accounting officer ( a position held by the financial secretary), the CBK went ahead and made the payments. “I am writing a book that will tell the story,” he told us. Fortunately, Dr Koinange died without telling his side of the story. During the Goldberg hearing, Dr Koinange acknowledged the illegality of his actions. Dr Koinange was at the Treasury at the wrong time. A man who had no knowledge of the workings of the Ministry of Finance, he had been catapulted from being Director of Medical Services (1979 – 1987) to PS ministry of research, science and technology. Here, he seemed to fit the professional bill, though this was far removed from his training as a medical doctor; a man who was proud to be a Fellow of the Royal College of Physicians Edinburg. Because he could not understand the inside workings of Treasury, senior officials at the Treasury, including his co-accused, the late Eliphaz Riungu, a former Central Bank deputy governor, would cook figures on foreign exchange to impress both the World Bank and IMF on the government performance. When Riungu was asked by the Justice Bosire Commission why he did that he would simply say: "We were cornering the IMF, we were being cleverer than them." Was Dr Koinange part of this syndicate? Perhaps. 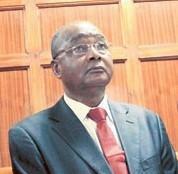 During the Goldenberg hearing, it emerged that Dr Koinange had sought the CBK Governors word on the payments. He told the Commission that indeed it was the then CBK Governor. Eric Kotut who authored the infamous authorization letter. Mr Kotut denied this on oath. The Justice Bosire Commission appeared to absolve President Moi from blame which left Dr Koinange holding the smoking gun: “There is no clear evidence that the President asked for money to be paid which was in fact due to Pattni or Goldenberg International., and it would certainly have been possible for Dr Koinange to tell the President that the money was not due.” [Justice Bosire was found unsuitable to be in the judiciary for failing to summon senior government officials, including President Moi who had been adversely mention during the sittings.] The death of Dr Koinange has left many unanswered questions on his role in this fictitious export compensation project that saw mandarins behind the Goldenberg scam penetrate CBK and milk Sh5.8 billion from the coffers. “There was no legal claim to the money, in the manner in which it was paid out….Dr Koinange purported to rely on a letter from Customs which cannot be interpreted to be a statement that any money was actually due,” said the Goldenberg report which recommended Dr Koinange’s prosecution. “The PS Treasury Dr Koinange, the Governor and his Deputy Mr Riungu were personally responsible for this (loss). Dr Koinange’s assertion that he was ordered by the former President to pay out Sh 5.8 billion is doubtful. He and the Governor of CBK, among others both in Treasury and CBK, were the economic managers….if as he says a decision was reached to pay out in a discreet manner it is only fair that they bear the responsibility for the illegal payments.” That haunted dr Koinange for long. He hired good lawyers. Kept tabs on his case and never missed a mention. He looked weathered in court appearances as his co-accused succumbed to cancer. With his resources dwindling and his frantic efforts to clear his name coming a cropper, Dr Koinange died with a huge burden. your authorization letter must be simple and use bullet formats in your letter. Letters are indeed very important for communication. He was also a great collector of African music and plants that dot his farm. Sory for this man D.r koinange...An interllectual he was,but fate seemed to have been sealed on his side..Light shall overcome darkness and the truth shall be known....R.I.P..